A map shows which counties voted for Democrat Hillary Clinton and Republican Donald Trump in 2016. Tuesday’s election results offer further evidence that Texas mirrors America, with urban voters strongly favoring Democrats, while rural and many suburban voters favor Republicans. Republican Donald Trump beat Democrat Hillary Clinton in 227 of the state’s 254 counties, racking up an advantage of 1,697,593 votes. His biggest vote yield came in Montgomery County, one of several suburban counties — like Collin, Denton and Parker — that turned in reliably high Republican votes. Tarrant was the most populous county in his column, turning in a pile of Republican votes in spite of Clinton’s victory in Fort Worth, its biggest city. Trump also won many of the state’s mid-size cities and nearly all of its rural areas. Clinton beat Trump in 27 counties by a total of 883,819 votes. That was enough to cut his overall margin in half, but not nearly enough to pull off a Texas upset. Here’s another thing spotted in a run through the election results: Straight-ticket voting doesn’t always tell you how the political winds will blow. Her wins came in some of the state’s biggest counties — Harris, Dallas, Bexar, Travis, El Paso, Hidalgo and Fort Bend. 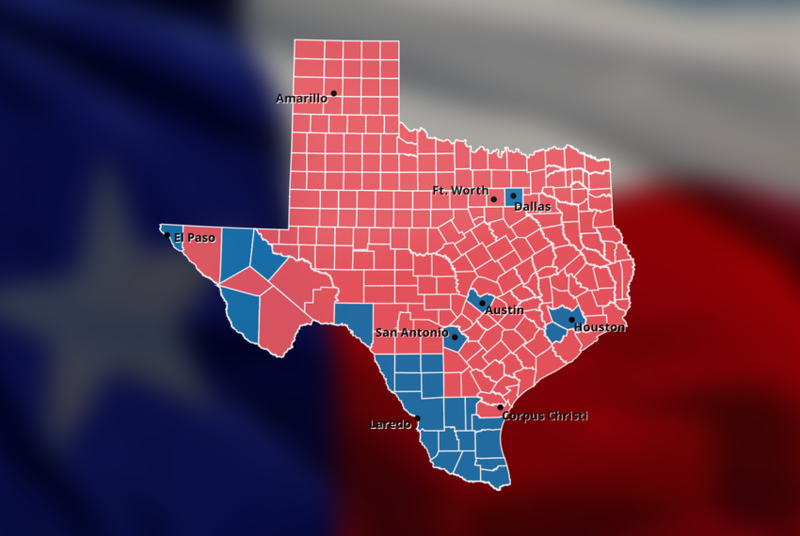 He won the vast majority of rural Texas, but not everything: Clinton took a few relatively unpopulated counties like Kenedy and Culberson. Trump’s overall margin was smaller than Mitt Romney’s 2012 win in Texas. In fact, the Republican at the top of this year’s ticket got a smaller percentage of the overall vote in Texas than any of the eight Republicans running statewide here, a group that included candidates for the Railroad Commission and the state’s two highest courts. Conversely, Clinton got a higher percentage of the vote than any of the Democrats running statewide. A win is a win is a win, and this year belonged to the Republicans. Their streaks are intact: They’ve won the last 10 presidential elections in Texas and every statewide race in every election since 1994. But one takeaway from this year’s contests is that Democrats reduced the normal Republican margins and their scattered blue spots on the Texas map — the state’s biggest cities — turned in stronger Democratic performances than they have in the past. State Rep. Bobby Guerra, D-Mission, won 56.8 percent of the vote even after being tied to an unpopular ballot measure that would have created a hospital district in Hidalgo County. Most voters — 71.8 percent — opposed that proposal even while re-electing its author. One clue to his survival was that 49.7 percent of the county’s voters were straight-ticket Democrats, while only 16.3 percent voted straight-ticket Republican. Straight-ticket voters in Harris County wiped out courthouse Republicans, including state district Judge Ryan Patrick, son of Lt. Gov. Dan Patrick. That house-cleaning — Democrats won every countywide seat in the state’s biggest county — stirred some intra-party recriminations between supporters of county GOP Chairman Paul Simpson and those of his predecessor, Jared Woodfill. But consider this: 35 percent of the voters were straight-ticket Democrats, while Republicans lagged behind at 30 percent. The straight-ticket demon didn’t get everybody. Travis County Commissioner Gerald Daugherty — he of the most popular political ad in the country during this election cycle — won re-election despite a nine-point disadvantage in straight-ticket voting and Trump’s 18-percentage point loss to Clinton in Daugherty’s commissioner district. Turnout was down and also up, depending on how you want to think about it. Unofficially, 8.9 million people voted this year, up from just under 8 million four years ago. That’s 59.1 percent of the state’s registered voters this time, 58.6 percent last time. As a percentage of the state’s adults, turnout was 42.9 percent on Tuesday, down from 43.7 percent four years ago. They might not have predicted this, but Republicans won full control of the federal government in Tuesday's elections. For Texas Republicans, that removes a major political foil. We've reached the eve of the election, with many political fortune-tellers predicting big changes in Texas. Here's a way to measure it, if it happens. Some elections are referendums on issues, public votes that give lawmakers a good idea of what voters want. This election isn't one of those.